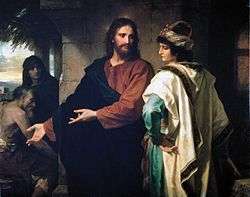 Yeshua and the rich young man (also called Jesus and the rich ruler) is an episode in the life of Jesus in the New Testament that deals with eternal life and the World to Come. It appears in the Gospel of Matthew 19:16–30, the Gospel of Mark 10:17–31 and the Gospel of Luke 18:18–30. It relates to the Evangelical counsels of chastity, poverty and obedience. When he heard this, he became very sad, because he was a man of great wealth. Jesus looked at him and said, "How hard it is for the rich to enter the Kingdom of God / Indeed, it is easier for a camel to go through the eye of a needle than for a rich man to enter the kingdom of God." The disciples then ask Jesus who then can be saved, and Jesus replies: "What is impossible with men is possible with God." 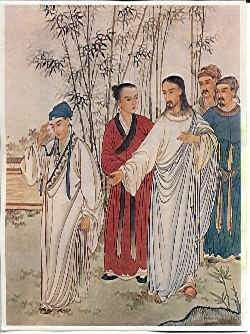 A non-dispensationalist view of Christ's response to the man's question on inheriting eternal life is to understand that Jesus knew that there would be none who could do a good enough work to merit such a gift as eternal life (Romans 3:12), but for the benefit of all who would eventually read this scripture he described the repentant believer's first steps of faith. While simply obeying commandments and selling your riches will certainly yield nothing by itself, the important phrase comes as the end of Jesus' recommendations: "come, follow me." (Luke 18:22, KJV) Thus, grace is the invitation to follow, and faith is the ingredient which compels a man to forsake all earthly cares in pursuit of the "author of eternal salvation" (Hebrews 5:9, KJV). The Rich young man was the context in which Pope John Paul II brought out the Christian moral law in chapter 1 of Veritatis Splendor. Wikimedia Commons has media related to Jesus Christ and the rich young man.